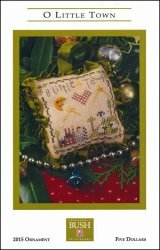 2015 Ornament O Little Town [G1922] - $5.00 : Yarn Tree, Your wholesale source for cross stitch supplies. A cross stitch pattern by Shepherd's Bush Printworks. Sheep are grazing on a hill with a little town in the distance, stars, a heart, and "O Little Town" accent the sky. Stitch count 42 x 42.